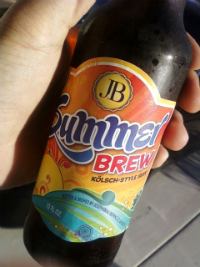 well i wasn’t much of a fan of this brew… i was hoping for a refreshing mild (in flavor) taste, but it wasn’t like that. flavor was boring… it wasn’t terrible… just didn’t make me say “ooh that’s nice” — i wouldn’t get this again. hell, i even tried drinking it outside while cleaning my car (whilst wearing daisy dukes and uggs) — now get that image outta your head!